Screenshot of the interactive installation On Broadway. Interactive installation On Broadway in the exhibition You Are Here NYC: Art, Information, and Mapping, The Pratt Manhattan Gallery, New York City, September 22 – November 15, 2017. Photo: Lev Manovich. 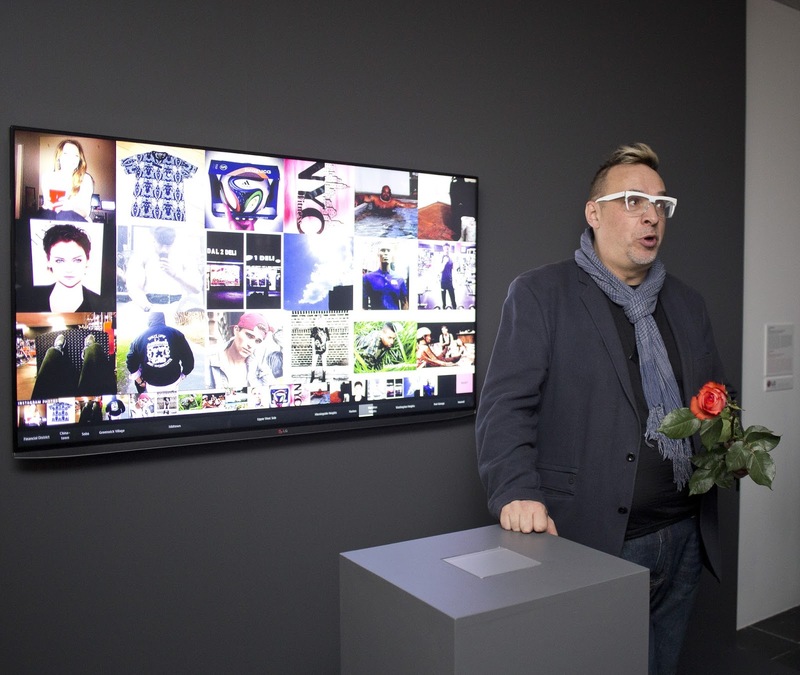 Lev Manovich presents the interactive installation On Broadway at the opening of Data Drift, curated by Lev Manovich, Rasa Smite, and Raitis Smits, Riga, Latvia, October 8 – November 22, 2015. View more photos from the exhibition opening on Flickr. See the installation shots on Flickr. 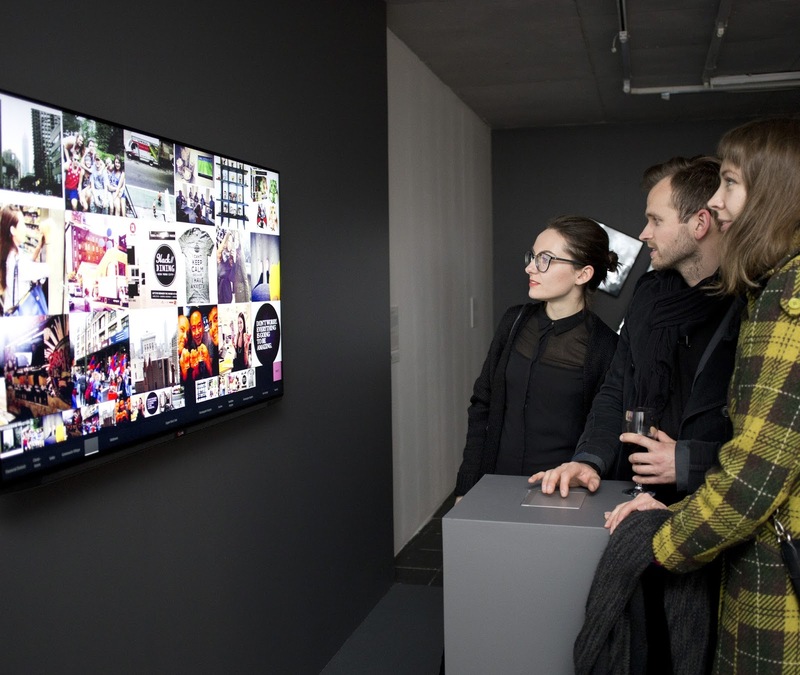 Interactive installation On Broadway in the exhibition Data Drift, curated by Lev Manovich, Rasa Smite, and Raitis Smits, Riga, Latvia, October 8 – November 22, 2015. View more photos from the exhibition opening on Flickr. See the installation shots on Flickr. Interactive installation On Broadway in the exhibition Public Eye: 175 Years of Sharing Photography, New York Public Library (NYPL), December 13, 2014 - January 3, 2016. Artists: Daniel Goddemeyer, Moritz Stefaner, Dominikus Baur, Lev Manovich. Contributors: Software Studies Initiative (Mehrdad Yazdani, Jay Chow), Brynn Shepherd and Leah Meisterlin, and PhD students at The Graduate Center, City University of New York (Agustin Indaco, Michelle Morales, Emanuel Moss, and Alise Tifentale). 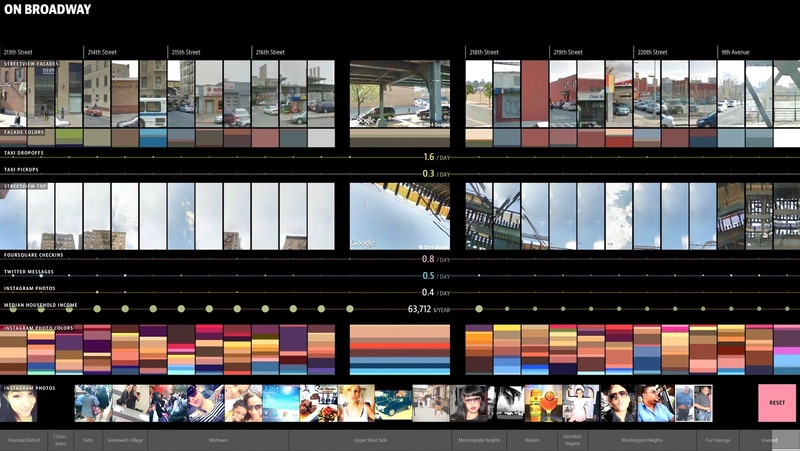 On Broadway is an interactive application and a public installation commissioned by the New York Public Library for its exhibition Public Eye: 175 Years of Sharing Photography (December 2014-January 2016). 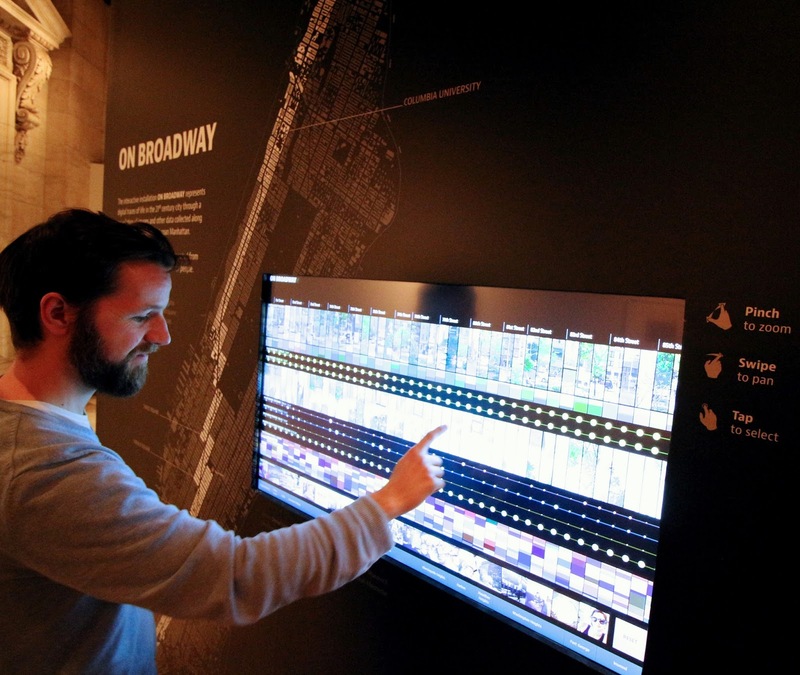 The interactive installation represents life in the 21st century city through a compilation of images and data collected along the 13 miles of Broadway that span Manhattan. The result is a new type of city view, created from the activities of hundreds of thousands of people. 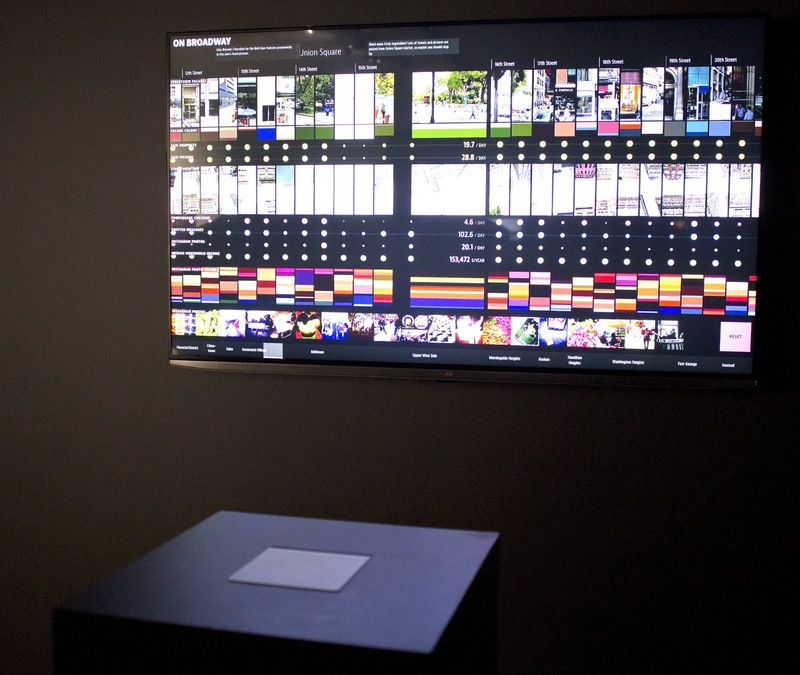 Neotopia: Data and Humanity, Art Center Nabi, Seoul, South Korea, November 1, 2017 – January 31, 2018. You Are Here NYC: Art, Information, and Mapping, The Pratt Manhattan Gallery, New York City, September 22 – November 15, 2017. Data Esthetics exhibition, ACM Multimedia 2016, Amsterdam, The Netherlands, October 15 - 19, 2016. The Digital Visual. An exhibition of information design, Kutztown University, Pennsylvania, October 22 – November 22, 2015.